Below are some recommended readings on the topic of poker, poker strategy, and what poker players call “leveling” which is thinking on the plane higher than your opponents! The subject of this book is strategy — not military strategy alone but strategy in general. It concerns the elusive nature of the thread of opposition and conflict that runs through the various interrelationships of men, from the striking of a bargain in the market to the dread clash of war. The first part of the book is about poker, the game; the idea of strategy presented here is based on a theory of games. The second part elaborates a new game theory, applicable to all games, poker, bridge, chess and others; but its principal purpose is to illuminate the”game” of business. Part Three describes the strategies of buyers and sellers — of which poker is the model — and the tendency to form combinations, which is at the root of monopoly. The fourth part is concerned with military and other more general applications, including a suggestion of the probable strategy of atomic war. The theory and practice of poker will be immediately recognizable to every attorney who has ever made a strategic choice in the face of uncertainty. Lawyers are faced with a never-ending stream of decisions that require swift action but that are necessarily made based on spotty information. The most obvious decision is whether to settle or proceed to trial, but there are also many other, smaller decisions along the way — which deposition to take, which motions to file, which theories to pursue, which questions to ask — each one influenced to one degree or another by the opponent’s behavior. Poker is a great teacher: it provides intensive instruction in mathematics and probability, human psychology and interpersonal relationships, and gives players the chance to see exactly how they react under pressure. 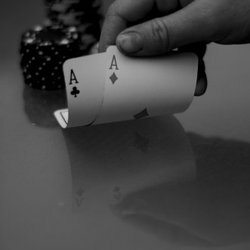 The ability to look someone straight in the face and go “all in” while holding nothing more than a pair of deuces and a confident smirk can offer even bigger payouts in your career. This book consists of fifty problems from no-limit hold’em tournaments, both live and online. The book is laid out as a big quiz. In each problem, you the reader are presented with the decisions faced by one of the participants in the hand. Your job is to pick the play you would make in the given situation. In most cases the hand continues through many decision points. Ankeny rigorously articulates a randomizing strategy for bluffing. Mark Twain makes the case that poker is a game of skill by telling a wonderful story about a jury trial the outcome of which turned on the question. Not a poker book per se, but one of the great books for understanding the idea of worlds within worlds.